The Possibilities Are Endless with Neo-Metro’s Custom Designs Stevenson Systems is a commercial real estate account firm specializing in providing measurements and consulting for commercial real estate owners. 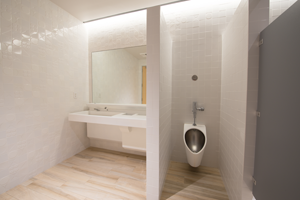 The company was in need of bathroom and kitchen installations at their headquarters in Laguna Nigel, California. The company wanted to eliminate the problem of water on the floor of the restroom due to the poor design of the existing sinks. Stevenson Systems wanted their new unit to have integrated elements, such as a built-in soap dispenser, paper towels, and trash receptacles. They also wanted a look that appealed to the aesthetic of their restroom and complied with ADA requirements. They soon realized that their exacting needs would best be served with customized products. The company turned to Neo-Metro for their expertise, personalized customer service and ability to design and manufacture stylish custom products for their bathroom and kitchen projects. As a manufacturing company that designs and manufactures luxury hospitality and residential custom plumbing fixtures, Neo-Metro has maintained the expertise and knowledge to deliver state-of-the-art, reliable, cost-effective and custom luxury fixtures which are engineered to fit most any building type for renovation and new construction projects. The bathrooms at Stevenson Systems now have custom System M2 basins with custom lengths and bowl dimensions. Both basin systems are stainless steel with a matte white powder coating. A basin shelf contains a sensor-operated faucet, soap dispenser, and paper towel well. A custom, built-in trash receptacle, paper towel holder and trap enclosure complete each basin. 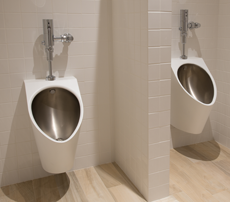 In addition, custom finish, matte white powder coated Contour Urinals with satin stainless steel bowls were added to the men’s room. Neo-Metro was also able to add some customization to the Stevenson Systems kitchen. The company designed and manufactured a custom stainless steel kitchen countertop with sink and drip tray to complement the high end cabinets and appliances. One of Stevenson Systems’ primary concerns with this project was the quality of the product. They were concerned about whether the products would hold up and continue to look good years after they were installed. 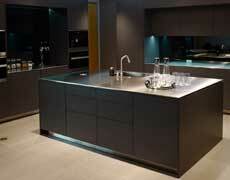 Their concerns were addressed by Neo-Metro and they are very satisfied with their custom installations. “What’s phenomenal about Neo-Metro is the construction of their equipment and engineering.” Stevenson said. 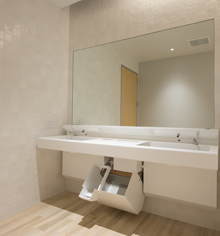 Neo-Metro’s custom products gave Stevenson Systems’ restroom and kitchen a modern look that will comply with ADA guidelines and remain both functional and beautiful for years to come. “Their ability to customize the order to our exact specs was a huge deal. We wanted custom made ADA compliant products designed to our exact needs and Neo-Metro delivered,” says Stevenson. Have a comment or question? Please head on over to our Facebook page or LinkedIn page and let us know in the comments.